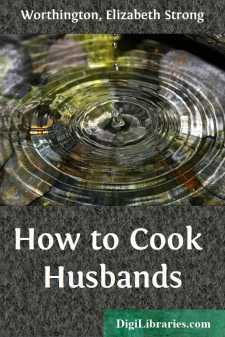 “A great many husbands are spoiled by mismanagement. Some women go about it as if their husbands were bladders, and blow them up; others keep them constantly in hot water; others let them freeze, by their carelessness and indifference. Some keep them in a stew, by irritating ways and words; others roast them; some keep them in pickle all their lives. Now it is not to be supposed that any husband will be good, managed in this way—turnips wouldn’t; onions wouldn’t; cabbage-heads wouldn’t, and husbands won’t; but they are really delicious when properly treated. “In selecting your husband you should not be guided by the silvery appearance, as in buying mackerel, or by the golden tint, as if you wanted salmon. Be sure to select him yourself, as taste differs. And by the way, don’t go to market for him, as the best are always brought to your door. “It is far better to have none, unless you patiently learn to cook him. A preserving kettle of the finest porcelain is the best, but if you have nothing but an earthenware pipkin, it will do, with care. “See that the linen, in which you wrap him, is nicely washed and mended, with the required amount of buttons and strings, nicely sewed on. Tie him in the kettle with a strong cord called Comfort, as the one called Duty is apt to be weak. They sometimes fly out of the kettle, and become burned and crusty on the edges, since, like crabs and oysters, you have to cook them alive. “Make a clear, strong, steady fire out of Love, Neatness, and Cheerfulness. Set him as near this as seems to agree with him. If he sputters and fizzles, don’t be anxious; some husbands do this till they are quite done. Add a little sugar, in the form of what confectioners call Kisses, but no vinegar or pepper on any account. A little spice improves them, but it must be used with judgment. “Don’t stick any sharp instrument into him, to see if he is becoming tender. Stir him gently; watching the while lest he should lie too close to the kettle, and so become inert and useless. “They are really delicious when properly treated,”—I wonder if that is so.